Photographer Monica R. Goya is nominated in two categories: Bring Home the Harvest, and Food For Sale, both images taken for the delightful story below. Her photos were chosen from 9000 entries from 77 countries. Good luck Monica! 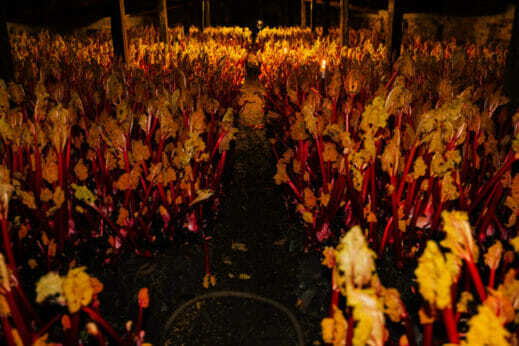 Robert Tomlinson’s family has been growing rhubarb since the 1880s. His out-of-season forced rhubarb is a delicacy during winter. 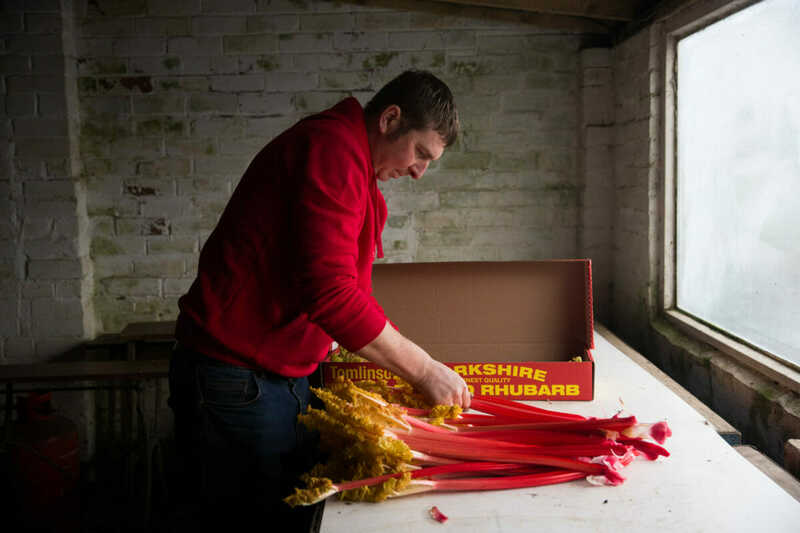 Forced rhubarb thrives in idyllic Yorkshire, to the point where the produce grown in the fertile Rhubarb Triangle — the area between Leeds, Bradford and Wakefield — has been protected by European Designation of Origin status since 2010. An 1817 paper titled “Transactions of the Horticultural Society of London” credits Chelsea Physic Garden in London as the original place where rhubarb was forced. “All we do is trick the rhubarb into thinking that it’s spring by warming them up,” says Tomlinson of the growing method for his out-of-season rhubarb. 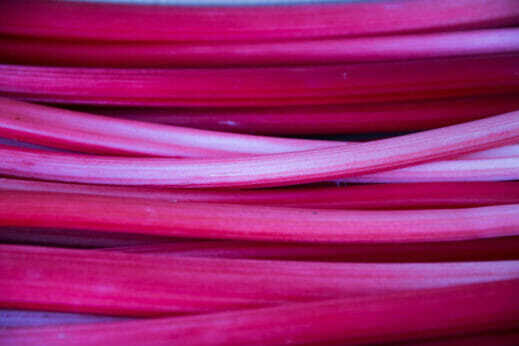 Harvested in the winter months, his forced rhubarb has a mesmerizing bright pink hue, tenderness and sharp taste that make it a delicacy. But how is it possible to grow a summer vegetable in the depths of a British winter? In the 1980s, Tomlinson’s dad, David, had 12 forcing sheds, but they dwindled down to one. Now, to meet increasing demand, they have four, which is about 30 acres. “A lot of the growers gave up,” he says. 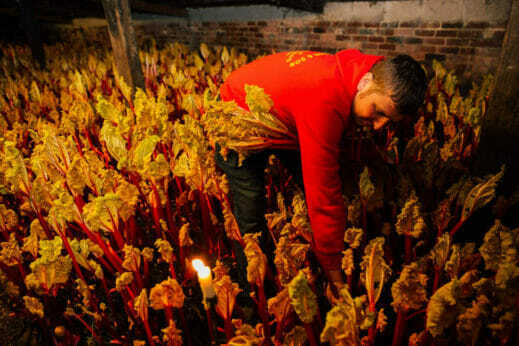 In Yorkshire alone, there used to be 200 people growing rhubarb, and now there are about 10. Tomlinson grows pre-Second World War crowns, like Victoria, and other varieties, such as Stockbridge Arrow and Harbinger, which date back more than 40 years. Visiting Tomlinson’s dark sheds verges on the mystical. “Except for the insulated roofs, heating and use of paraffin instead of coal, it’s exactly the same as it was 100 years ago,” he says. This includes hand harvesting by candlelight because darkness prevents photosynthesis from making the stalks bitter. Tomlinson’s Yorkshire forced rhubarb is available in New York City. But in the U.K., 90 percent of his production goes to restaurants and hotels and 10 percent is sold at local shops around the Leeds area.